Blue Diamond tipple seen here on the Nora Branch at milepost N-5.8. Construction on the Nora spur started in 1925 on the original 5 miles. After the Clinchfield acquired ownership they finally finished the 1.3 mile addition up to Blue Diamond in 1943. Blue Diamond was the second largest coal producer on the Clinchfield Railroad. Nora Branch was the oldest branch line of the Clinchfield era that began service around 1944. Looking at the loading area of Blue Diamond tipple at milepost N - 6.0, the end of the branch line. 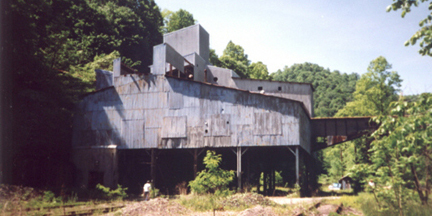 NW-2 was purchased by Clinchfield Coal company for use at the Kilgore Creek tipple. Former CRR #359 seen here at Kilgore Creek tipple. Former CRR #821 was sold to Clinchfield Coal Company in Dec. of 1977. Open Fork #2 at milepost N- 4.3 was in operation until the late 70's. Special thanks to Wayne Hannan for all the above photos. CCC #014 is now at Tennessee Valley Railroad Museum seen here in Oct. '97. Open Fork bridge is located in Nora, Virginia. An old dump truck looks like it's waiting for the cutting torch along side the tracks. Drilling equipment laying along side the road that leads to Neece Creek. Looking at the silo of Neece Creek, not much action going on here anymore.